The Sustainable Development Goals (SDGs) are an inter-governmentally agreed set of targets serving as a universal call to action to end poverty, protect the planet and ensure peace and prosperity for everyone. The six Model Forest principles guide landscape-level initiatives – from social or scientific research and policy development to capacity building and piloting new technologies – ensuring that natural resources and forest lands are managed in a sustainable, inclusive, and equitable way, while contributing directly and indirectly to the achievement of most of the 17 SDGs. Each Model Forest is a neutral forum that welcomes voluntary participation of representatives of stakeholder interests and values on the landscape. Model Forests are voluntary and diverse partnerships designed to create, mobilize and share knowledge, expertise and technology locally, nationally and internationally (North-South, South-South and North-North). The partnership works to build capacity for implementing sustainable development initiatives. Model Forests bring together public-private and civil society in cost-effective and shared-risk partnerships designed to collaboratively develop a strategy for the sustainable development of a given area. The partnership also brings new resources to the table – whether cash or in-kind. Model Forests convene stakeholders and create a partnership as complex as the values and uses of the landscape it encompasses. As exemplified by the Araucarias del Alto Malleco Model Forest in Chile, indigenous people, local communities, women and the underprivileged who are often overlooked as potential partners provide important contributions and benefit from efforts from participating in a partnership to achieve more sustainable outcomes. Additionally, as an international network, the International Model Forest Network (IMFN) participates in other fora to share ideas, resources and expertise. For example, IMFN is a member of the Global Partnership for Forest Landscape Restoration (GPFLR), an informal network dedicated to advancing the Bonn Challenge to bringing 150 million ha of land into restoration by 2020 and 350 million ha by 2030. The IMFN also works in partnership with other international organizations or associations concerned with similar sustainability issues, such as the Food and Agriculture Organization of the United Nations (FAO) , The Tropical Agricultural Centre for Research and Higher Education (CATIE) and the International Union for Conservation of Nature (IUCN). A large-scale biophysical area representing a broad range of forest values, including social, cultural, economic and environmental concerns. Model Forests are large-scale biophysical areas encompassing a broad range of forest values, natural resources and diverse ecosystems. They are watershed scale approaches to natural resource management where forests are an important feature in the landscape, but certainly not the only one. The forest-farm interface, for instance, represents a critical component of many Model Forests, as does the rural-urban interface. As an example, research conducted by the Chiquitano Model Forest of Bolivia identified the native leguminous Chiquitana Almond (Dipteryx alata) typical of wooded savannas as an ancestral food source with nutritional value, both for humans and for wildlife and cattle. A strategy to increase the production of the Almond as a food source was developed without expanding the agricultural frontier, and mitigating the socio-environmental vulnerability to the climatic changes. 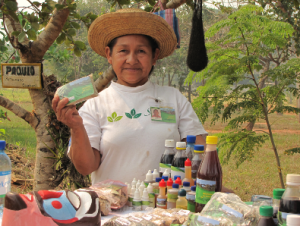 A Chiquitana woman from Santiago de Chiquitos (Bolivia), part of the Association of Natural Medicine, with a sample of the products obtained from the wild plant species of the Chiquitano Forest. Forest and landscape restoration (FLR) is a key theme in Model Forests, FLR’s dual objectives to restore degraded lands while also improving human well-being through multifunctional landscapes is ideally suited to the Model Forest approach. For example, the in Colombia is one of 11 Model Forests in Latin America contributing to the 20×20 Initiative in support of the Bonn Challenge. Through FLR, Model Forests promote the use of FLR frameworks such as Restoration Opportunities Assessment Methodology (ROAM), build capacity in FLR techniques, strengthen links between national commitments and directly contribute to mitigating and adapting to climate change at the local level. Because they operate at a landscape or watershed level, many Model Forests are directly concerned with integrated water resource management at the local level, linked to an intent to share best practices at a national or regional policy level. Chorotega Model Forest in Costa Rica is one example of the latter, where stakeholders are implementing actions to preserve the lands in the river basin to restore water flow. Model Forest landscapes can also include coastal areas, as well as mangrove forests, which are critical for marine habitat and mitigating impacts from extreme weather events. The plantation of 40 mangrove species to buffer strong waves and provide spawning habitat for coral fish (which are important for the livelihood of local fishermen) in Carood Watershed Model Forest in the Philippines is an illustration of actions Model Forests undertake to ensure the conservation and the sustainable use of marine and coastal resources within their boundaries. Stakeholders are committed to the conservation and sustainable management of natural resources and the forested landscape. Model Forest stakeholders are committed to the conservation and sustainable management of natural resources and the forested landscape, including the equitable distribution of economic and social benefits derived from those resources. They also explore and promote practices that contribute to maintaining and/or restoring the ecological integrity of the landscape. Whether in a developed or developing country context, Model Forests do this using a cross-sectoral approach addressing the three pillars of sustainable development. Model Forest priorities are reflective of local and national management challenges and occupy the space between policy and practice, where national commitments or programs such those related to climate change (REDD+), to Forest Landscape Restoration (Bonn Challenge and others), or to the protection of biodiversity (CBD protocols) as examples – can be tested before being scaled up, or where local programs can be shared with governments for application beyond the Model Forest boundary. The Eastern Ontario Model Forest in Canada participating in the leading-edge ecosystem services project held by the Forest Stewardship Council (FSC) is just one example. The community-based tourism program initiated by Mapuche women in Panguipulli Model Forest in Chile and the switch from illegal logging to ecotourism made by residents of Ulot Watershed Model Forest in Philippines are inspiring examples of local communities obtaining multiple benefits from the adoption of sustainable practices. Model Forests have also proven to be particularly good at the social side of sustainability – the most difficult of the three pillars to measure. Involvement in a Model Forest ultimately changes the way people think, and then act, towards each other and their natural environment. This is closely linked to Principle 4 on governance below. The Model Forest management process is representative, participative, transparent and accountable, and promotes collaborative work among stakeholders. In a Model Forest, stakeholders work together using consensus-based processes to attain a common vision and objectives. While there are attributes to describe what a Model Forest is, there is no template for how one must be structured. Each Model Forest has its own self-directed and unique governance structure. The actions of the Model Forest are governed by principles of trust, transparency and collaborative decision-making, while respecting various interests and values. The decision-making structure is accountable, sets priorities and manages activities effectively. Through their inclusive governance structures, Model Forests provide a space at the table for typically marginalized stakeholders, such as women and indigenous peoples. A defined attribute in support of the partnership principle states that discrimination against any person or group of people is prohibited. Along these lines, the Ibero-American Model Forest Network (IAMFN) launched its Gender Equity and Equality Strategy, to support its members in ensuring representation that is more balanced. This regional tool provides guidelines for institutionalizing a gendered approach to sustainable landscape governance that is being implemented in Latin America and shared with other parts of the network. Building stakeholder capacity for voicing concerns, decision making and collaborative planning provide building blocks for effective democratic participation. Conflict resolution is frequently a Model Forest benefit, as the approach can function as a learning lab for constructive negotiation and consensus building on local sustainable development priorities, as well as a platform for connecting marginalized groups to larger society and institutions. The creation of the Parque Nacional Los Haitises-Pueblo Viejo biological corridor in Dominican Republic is an illustration of such a convergence among different actors, where, building on a process initiated over 26 years ago, the Colinas Bajas Model Forest brought together local stakeholders, including municipal and national governments and a mining company to extend a successful forest landscape restoration initiative. The activities undertaken by a Model Forest are reflective of the Model Forest’s vision and stakeholder needs, values and management challenges. Model Forests are designed to facilitate innovation in the sustainable management of large landscapes. The approach can achieve multiple benefits for its people and communities dependent on the features of that landscape as well as local priorities: economic development, food security, conflict resolution, wood or non-wood products, water supply, energy, and more. Model Forest stakeholders undertake activities that reflect their needs and support national forest and other programme activities, facilitating and promoting knowledge generation and innovative solutions to the sustainable management of natural resources. In other words, each Model Forest is unique, and therefore the range of activities stakeholders undertake in pursuit of sustainable development varies widely. There are examples of Model Forest programming touching on each of the SDGs. For example, the production of organic fertilizers based on mycorrhizal microorganisms in East Cameroon involving the African Model Forest Network is an example of an initiative that created new jobs while also contributing to food security and climate change resilience. Several Model Forests have invested in the creation or expansion of small and medium sized enterprises (SMEs) such as ecotourism initiatives. Yalova Model Forest in Turkey, where partners developed new local economies through rural tourism, and the strengthening of the nature-based tourism sector in Bergslagen Model Forest in Sweden are two examples. Model Forests build stakeholder capacity to engage in the sustainable management of natural resources, and collaborate and share results and lessons learned through networking. Through its network structure, Model Forest stakeholders and participants in the IMFN are committed to local, regional and international knowledge sharing and networking. By design, Model Forests are intended to ‘speed up’ sustainability programming, processes and policy influence. They do this by exchanging experiences and lessons learned, strengthening local capacity to engage in the sustainable management of natural resources, and sharing their achievements and challenges nationally and internationally. The EcoAdapt Project implemented in three Model Forests in Latin America is an example of an inter-disciplinary and international action research process involving local communities, civil society organizations, policymakers and scientists searching to increase their collective capacity to adapt to climate change. Prince Albert Model Forest in Canada has been a champion at transferring and promoting knowledge to protect species at risk in the province of Saskatchewan such as the Sturgeon River Plains Bison and the woodland caribou, by involving indigenous communities and youth. Puerto Rico’s National Model Forest, the Chocó Andino Model Forest in Ecuador, the Pichanaki Model Forest in Peru and the Newfoundland and Labrador Model Forest in Canada are just a few examples of where Model Forests are leading inclusive learning programs such as “forest schools” where sensitivities are developed and awareness is generated around the natural environment. These initiatives seek to influence education to benefit the local population as well as to influence education nationally and internationally. Landscape level governance requires a critical examination of landscape dynamics (the ability to ‘see’ the landscape at scale and how an action in one place impacts another) to ensure informed decision-making by the stakeholders involved. To that end, Vilhelmina Model Forest in Sweden developed a participatory GIS system designed to help conserve the indigenous Sami way of life while mitigating conflict with forest industry. Having a visual understanding of migration corridors accessed by Sami reindeer herders, land managers can now adjust their activities to allow herders to maintain their traditional routes. To find out more about Model Forests, visit the News and Resources sections.